This is so delicious I couldn't stop eating it. If you do not have an actifry machine you could just do this as a stir fry. Rinse the scallops and pat dry with paper towel. Trim the asparagus and cut on the bias into pieces. Place the shallots into the ActiFry pan, drizzle with ½ spoonful (tbsp.) of oil and cook for 3 minutes. Add the thyme, lemon zest, asparagus, scallops salt and pepper. 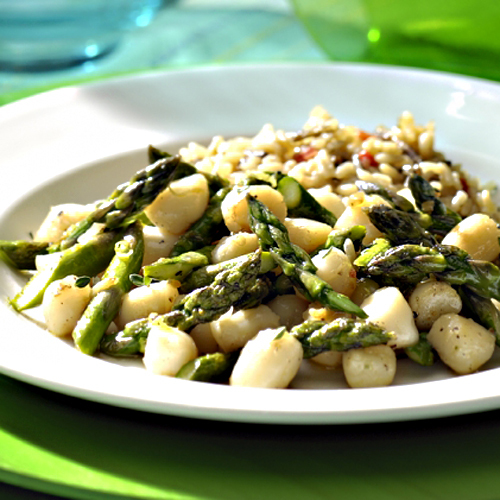 Drizzle with the remaining oil and cook for 9 minutes, until the scallops are opaque and the asparagus is crisp-tender. Drizzle with the lemon juice. Serve with the accumulated juices, over rice.